Malcolm Fraser was the Liberal politician who became Prime Minister when Gough Whitlam was sacked by Governor-General Sir John Kerr in 1975. In more recent years, Fraser became known as an outspoken critic of the harsh policies of successive Liberal and Labor governments towards refugees. He resigned from the Liberals in 2010, because he thought the party had moved “too far to the right”. He even became a patron of the Asylum Seeker Resource Centre in Melbourne. 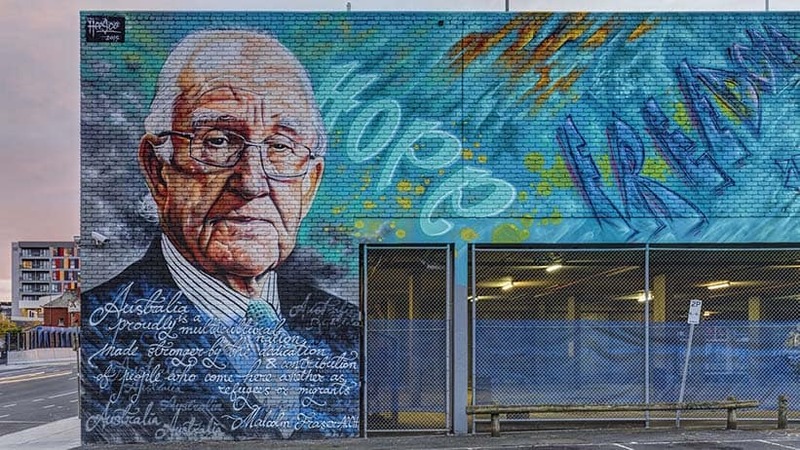 His visage is now immortalised as a huge mural on the side of the ASRC building in Footscray. Compared to the years of mandatory detention since its introduction under Labor in 1992, and the vicious detention regime established in the Howard years, the Fraser government’s record on paper looks creditable. Even so, while around 70,000 refugees were resettled between 1976 and 1982, only about 2000 were boat arrivals. Another 80,000 came through resettlement channels in later years. Clare Higgins’ work unearthing Immigration Department archives has added invaluable information for understanding the Fraser government and the dark role of the Immigration Department in shaping immigration policy. It deserves to be read. Who knew, for example, that Christmas Island was first suggested as a detention island in 1978 by NT Chief Minister, Paul Everingham? But her central thesis, that the present inhumane refugee policy has its origins in the mid-1980s, with the Liberal Party breaking with the approach adopted by the Fraser government, is questionable. There is plenty of material in Higgins’ book that shows present refugee policy is a continuation of the approach of the Fraser government rather than any break. In fact the political underpinnings of the present policy were established under Fraser. At the beginning of 1977, the Fraser government prepared a brief for a UNHCR conference which read in part that the Australian government, “will wish to retain its discretion to determine ultimately who can enter Australian territory and under what conditions newcomers may remain.” Sound familiar? Fraser admits in his autobiography that the government’s willingness to accept more refugees was a product of increasing boat arrivals, not the scale of the refugee crisis itself. Fraser didn’t use Abbott’s notorious slogan, but he did want to stop the boats. Fraser’s willingness to resettle Vietnamese refugees from camps in Malaysia, Indonesia and Thailand was fundamentally based on the assessment that resettlement could help prevent boats travelling to Australia. Fraser went to extraordinary lengths to prevent boats arriving. Higgins herself recounts the stories of Immigration officers disabling and sinking asylum boats by drilling holes in their hulls to disable the boats and prevent them being used to travel on to Australia. This was the sharp end of Fraser’s determination to “stop the boats” and ensure that the Vietnamese stayed in countries of first asylum. But the “border protection” politics that we are now so familiar with were also on display when asylum boats first arrived. On 26 November 1977, the Sydney Morning Herald ran a front page headline, “Fraser Warns Refugees,” that they were liable to be returned. The international commitment from Canada, the US and France to resettle the Vietnamese from the camps in south-east Asia was crucial to “stopping the boats” getting to Australia. In April 1978, an Australian government delegation went to the US to urge it to use its influence to ensure that Malaysia, Thailand and Indonesia prevented the Vietnamese from leaving the camps to sail on to Australia. Space limitations prevent a discussion here about who first coined the “queue jumpers” phrase, although Whitlam certainly used the term in the 1977 federal election. For our present purposes, it is enough to know that then Labor shadow Immigration Minister, Moss Cass, recalls an immigration department official using the term at a bi-partisan briefing in April or May 1978. That meeting decided that processing refugees in offshore camps would be prioritised over those who arrived by boat. In April 1979, Mackellar told The Australian that he, “no longer considered refugees arriving by boat to be ‘queue jumpers’.” The camps in south-east Asia were full and more boats were thought to be on the way to Australia. But just seven months later, when a boat of 50 people arrived off the West Australian coast, MacKellar issued a press statement expressing concern at the resumption of boat arrivals. “The whole Indo-Chinese refugee program could be placed in jeopardy if refugees continue to arrive in such a manner”, he said. “Apart from the enormous risks involved in such a perilous journey, it is unfair to those in refugee camps who are prepared to wait for orderly processing”. Mackellar may not have been using the term “queue jumpers”. But his public comments, just as surely, spelled out the queue jumper argument in terms that are still used by politicians today. Higgins tells the story of the threatened arrival of the Hai Hong, a large steel-hulled vessel carrying 2500 Vietnamese asylum seekers, in November 1978. Indonesia denied it entry. Malaysia refused to allow the passengers to disembark unless there were guarantees of resettling countries. The Hai Hong was left in limbo off the coast of Malaysia as diplomatic cables flew around the world. Australia made it clear that it would not resettle any asylum seekers on the Hai Hong. But the Fraser government was very worried that the Hai Hong might head for Australia. Advice prepared in 1978 by the Immigration Department canvassed the whole range of possible mistreatments of boat arrivals that have been progressively imposed over the years. They included, to try and intercept the ship and turn it around at the then three mile ocean boundary; to hold the ship in a remote location and try to force it to leave; to establish a transit camp in a remote locality; and, if compelled to land the passengers, they could be given refugee status but denied resettlement in Australia. By managing to control the number of boat arrivals, the Fraser government avoided implementing these options. But the proposals were not rejected for all time. In May 1979, Mackellar was still telling Cabinet that a, “detention centre in Darwin” could be necessary. The government, however, did respond to the possibility of large numbers arriving with the Immigration (Unauthorised Arrivals) Act 1980. It was Australia’s first anti-people smuggling legislation, introduced into Parliament by Mackellar’s successor, Ian Macphee. Any consideration of the Fraser government’s approach as a compassionate alternative also has to consider the overall political context. Foreign policy considerations played a major role in determining refugee policy. In October 1976 dozens of students at the Thammasat University demonstrating against military dictatorship were killed by the Thai military. Unlike Whitlam, who had allowed all Vietnamese students in Australia to stay after Saigon fell in 1975, Fraser did not allow all Thai students to remain in Australia. Fraser had little sympathy for the students who were considered left-wing. He also did not want students from other regional dictatorships, like Indonesia, getting any ideas. Many Thai students were subject to deportation orders. Fraser’s flexibility on human rights can also be seen in regard to East Timor. In 1978, Fraser followed Whitlam’s shameful de facto recognition of Indonesia’s 1975 annexation, and gave de jure recognition in 1979. It is understandable that refugee supporters look back positively on a time when there was no mandatory detention and when the government organised for around 150,000 Vietnamese to be brought into the country. But in fact, ideas like stopping the boats, queue jumpers, making a distinction between good, deserving refugees who stayed in camps to be selected and bad refugees who arrived in Australia by boat, were all approaches that Fraser’s policies pre-figured. If the refugee campaign had been around under Fraser, it would have had to fight against “stopping the boats” and against vilifying asylum seekers as queue jumpers, just as we do today. When refugee supporters hanker for the Fraser government, it represents a hope for a genuinely humanitarian refugee policy, where refugees who arrive in transit countries are processed and resettled in Australia, where asylum boats desperately trying to gain protection are welcomed and assisted, rather then being turned back; and where asylum seekers arriving in Australia are not subjected to punitive detention, and certainly not expelled to offshore prisons. That is what the refugee movement is fighting for. But to end mandatory detention, to close Manus and Nauru, we need to understand the significant ways that means breaking from the politics of the Fraser government. Influential commentators like Robert Manne, Tim Costello, John Menadue and Frank Brennan have argued that the refugee movement should accept turnbacks in return for the closure of Nauru and Manus Island. Others argue that the movement should put forward proposals that would be more acceptable to the Labor and Liberal parties—ideas like “regional processing” and “burden sharing” (note the name!) are drawn from the Fraser experience. The refugee movement needs to fight for a welcome refugee policy that does not compromise human rights.